May the forth be with you. Well it was, last weekend, for the 3rd Steel City DH as this great edit from Gee Milner shows. The biggest little race in the North just keeps on expanding. This year, aside the 200 racers who ensured the entry was sold out within an hour and a half, over 100o spectators filled Grenoside woods heckling and eating and drinking everything that was on offer in the bombhole. When was the last time (other than a fort bill world cup) a mountain bike race had that many spectators in the UK? Peaty had to think back to the Malvern classic’s way back when to remember a similar atmosphere. This great edit from X Trail Films gives another angle of the day. For the first time ever for the race, the sun had been shining for the fortnight leading up to the race and the woods and the track was dry. The funds raised from last years race had been ploughed back in to the woods by the Sheffield Wildlife Trust and improvements to the track made by local firm Bike Track and volunteers from Ride Sheffield made for the fastest racing yet. Gone were the days of the muddy slog pedal fest, pumping through the rocky course and carrying speed through the bermed corners was the order of the day. As ever the generosity of the events sponsors was overwhelming with prizes galore for all podiums places and the every popular raffle. The race has always served to be completely inclusive with kids from age 10 upwards racing in the rippers category. This year we also had 30 ladies racing, amazing for a race of 200 people. They were split in to two groups; one for those racing for the first time and the other for those more experienced. Our oldest entrant was Pat Horscroft was in her 70th year and celebrating by racing for the first time ever. She was rewarded with a special award and bear hug from Peaty on the podium. As ever the atmosphere all the way along the track but particularly at the gap jump and finish bomb hole was electric. With so many people out watching and banging the hell out of the noise makers they had brought the racers were often seen smirking from the hilarious heckles. Although most prizes were given away on the podium or in the raffle one very important one remains. A brand new Blur TR donated by Santa Cruz bicycles. In a size large it up for auction on Ebay with all proceeds (minus the ebay fees) going directly in to the charity pot. The frame with a Fox Float CTD Adjust Kashima Shock is worth over £1900 and we are open to reasonable offers. Please use the best offer system on Ebay to make your bids. Ideally You’ll collect from Sheffield to give cash on collection so we can avoid paypal fees. If you want to win it, get your bids in here. Massive thank you’s to all the event Sponsors, Helpers and Marshals. Many people willingly give up their valuable time to make this race happen and it could not happen without them. Its part of what makes this race so special, the people and smiling faces that help year in and year out. Thank you! The race is organised by a team of 4 riders, myself Nick Hamilton, Steve Hardcastle, Henry Norman and Joe Bowman. If you see us out on the trails or at the bar, give us a pat on the back if you had a good day in the woods. I’m so excited about this new t-shirt design, it distils all that TiS is about in to print form: Dual, Radness, racing and Man Wolfs! We’ve collaborated with Max Patenoster, the President of the Corpses from Hell Motor cycle gang. Our Man Baybutt is the Sheffield arm of the crew and brokered the deal explaining through sketches, hand gestures and video what Dual racing is all about. He did a bloody good job. When Max finally made it to his first dual race last month he said “Ahhh… I got it right”. So true. 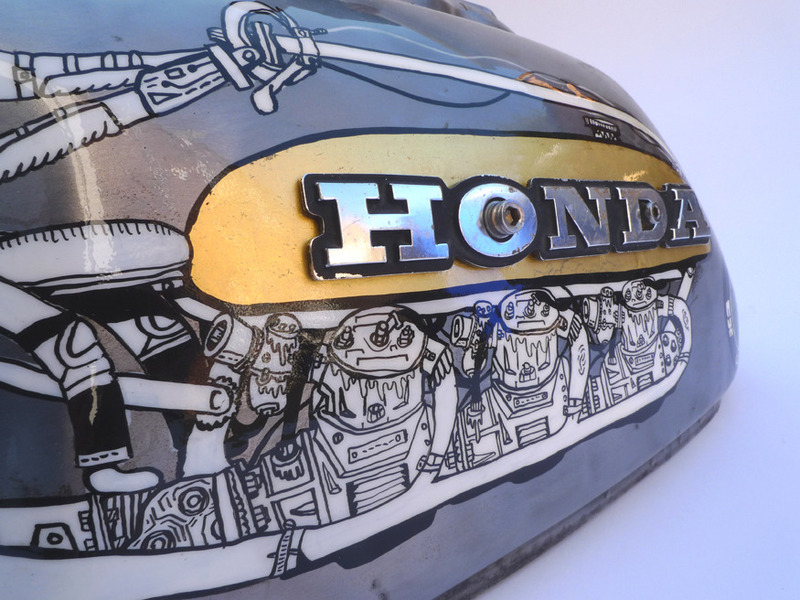 I first became away of Max’s work when he painted the fuel tank of Baybutts CX500. He uses gilding and his own inimitable style to come up with something truly unique. So here we have it. The all new ThisISheffield TShirt design. They will be initially exclusively available at the Peaty’s Steel City DH this weekend. What are left, will be for sale through our online shop next week. They’re a limited amount so get yourself along to the race if you want one. I’ll be on the registration desk from 8 to 10am then they’ll be for sale in the bombhole. The tee’s have been printed by Sheffield’s finest Crow and Dunnage on to the highest quality organic cotton tees. So, get one before they’re gone. The raddest tee you’ll buy this year… so buy two. A moggy March morning is what it all came down to.. After weeks of preparation from our very own Joe Bow and Nick Hamilton, with help from Steve Peat and plenty of others (sorry, i don’t actually know who was involved but thank you all) the race was finally upon us and ready to go..
An incredible atmosphere was buzzing around the Greno woods, as soon as sign in was completed my heart started jumping, i hadn’t been this excited by a race event in a long time.. maybe it was because i had entered my self in Pro-am for, ‘the laugh’ to see how id fair against some top riders. Sitting at my desk this morning, I’ve finally had a chance to look back and appreciate how good last weekend turned out to be. After so much planning,brain-storming,stressing and running about, it all came down to a damp Saturday day in March…. Steel City Downhill went off….. Reports,results and rantings coming soon, thankyou to all who came or helped out! Awesome. Final details for the race on Saturday, we’ve been working hard to make it a great event for you all. Please invite all your friends along to come and watch and cheer everyone along. Practice starts at 9, racing will start about 12 and prizes will be dished at about 3:30. On the day we’ll have catering from PJ Taste and a Bradfield Brewery beer tent open to keep you all moving. There will also be free bike checks from J E James cycles who will also have some basic spares for sale in case you break bits. The Bike Tree and Cotic are bringing along demo bikes for you to try out. Singletrack will be there giving away spot prizes as will Sustrans. We’ll also have a mini north shore area for everyone to try out. and we’ll add you our list. Bidding will continue on race day where your details will be taken by the Wildlife Trust. The highest bid currently stands at £500 and all money is going direct to the Charity so please be generous. Steel City T shirts will also be for sale at £10 each at the registration desk and around the site on the day. Freecaster.tv are sponsoring the video contest to demonstrate your camera and editing skills. The challenge is to put together an 1½ minute edit of the day’s race to be shown in the Showroom bar at 9pm the same day for all to see. Its up to you to make your work stand out and give the best impression of the day. All submissions must be submitted by 8:30pm to Will Ockelton, from Freecaster, in the showroom Bar and must be in a format to play on a Mac Laptop. The winner of the Video Contest will get an all expenses paid trip to the Fort William World Cup to join the Freecaster Crew and experience life as a professional cameraman for the weekend. All the best submissions will be featured on the Freecaster.tv website. The photo contest is being sponsored by Arc’teryx and is your chance to showcase your mountain bike shooting skills. You need to submit your 3 best shots of the day in JPG format also by 8:30pm to Will Ockelton in the Showroom Bar. They will all be shown alongside the video submissions in the bar on the big screen. The prize is an Arcteryx jacket worth hundreds of pounds to keep you warm and dry up on the hill next time you’re shooting. All the best submissions will be featured on Freecaster and future promotion of the Steel City Downhill. The judges for the contests read like a who’s who of mountain biking. The video contest will be judged by Steve Peat, Alex Rankin, Rob Warner, and Will Ockelton.The Photo contest will be judged by Dirt Magazine Photographer Grant Robinson and Art Director Jon Gregory, two men who know a good photo. If your work is good enough, there is a good chance it will end up in the magazine. Before entering either contest you must sign a disclaimer and release form at the race registration desk on the day. If you have not signed a disclaimer, you will not be eligible to enter. The car park for the day is located in a field just past the main Wharncliffe/Greno car park on the Woodhead road (postcode for satnav S35 7DS and then follow the signs). This is a little walk/ride to the race site itself so it would be worth bringing bits and bobs for the day with you when you leave. Please use the suggested route on the map below rather than walking on the road as its very busy!! Registration will take place in the car park from 8.15-10.00. Please bring a £5 note (we won’t have change for everyone so please fivers only) with you as a deposit for your number board (refundable at the end of the day when you return it as long as your number isn’t destroyed). You will need to sign on at this time and all under 18’s will need a parent or guardian to sign for them. You won’t be able to sign on at the course finish so please do this before you leave the car park! You’ll get a pair of smartwool socks and a cliff bar free. Practice will run from 9 until 12, the push up is less than 15 minutes walk so there will be lots of time to get plenty of runs in. At 12 we will finish practice, give all the marshalls a 10 minute break and then first race runs will start at 12.15. Each rider will get 2 race runs with the fastest counting toward final results. There will be no gap between first and second runs and please make sure you are at the top in time for your run. Run times will be posted in the finish area no later than 11am to allow you to check them. Many of our sponsors have provided spot prizes too. One final note which will help us out greatly, please take any rubbish with home with you at the end of the day. There will be a few bin bags around the place and at the start to take bits and bobs but please do take with you what we can. We need to keep the place tidy to keep the woods on our side for future races! Along side the race we’re teaming up with SHAFF, Sheffield’s adventure film festival at The Showroom Cinema. At 6pm on the evening of the race we urge you to follow us into town for an exclusive Alex Rankin film “Progression”. The film montage will take us from the early days of Sprung, all the way up to the latest Earthed release, showing how things in the sport of Downhill have taken a radical step in the last decade. The film will be followed by a Q&A interview session with Steve Peat who will be interviewed by Rob Warner. Tickets are now sold out, but there is a big party in the Showroom bar following the showing and we’ve got a very late licence and lots of musical entertainment. If you have any queries before the event please check the website and if you can’t find the answer there then email them to steelcityseries@gmail.com. We look forward to seeing you all enjoying yourselves on the day.